Flat pack C.K.D. fitting with pre-drilling. 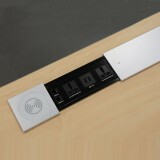 Cap available for concealed fitting. Housing available for 12, 16, 18 & 25 mm boards. New Dowel Pin is push fit in an Ø8mm hole. New Minifix screw diecast is available. Also Available with double ended bolt and M6 threaded screw with M6 Dowel. Rotor Screw is manufactured out of cold forged steel for strength, eliminating chances of breakage. The multi - functional plastic enables the screw to be held while fixing with a pneumatic screw driver as well as a perfect fit in the pre - drilled hole. 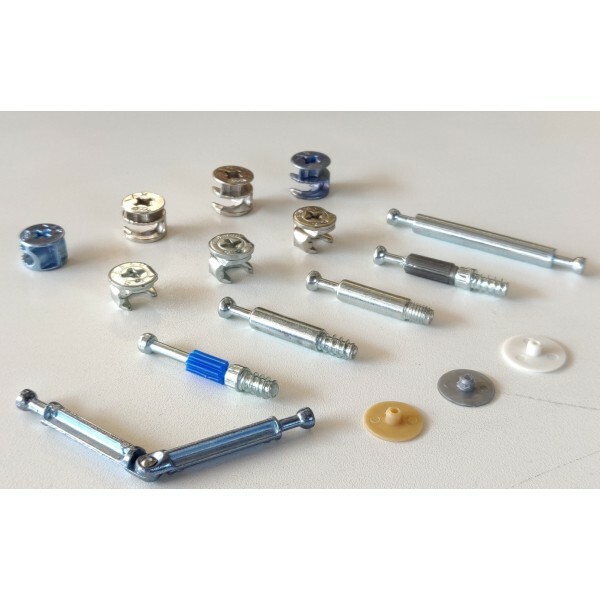 Mitre Joint Connectors are ideal for joinery cabinets having Mitre using Minifix. Mitre angles from 45° to 90° is possible. Split Dowel-Mini fix pin is made out of forged steel for strength. Special grade of plastic for reusability. Pin needs to be pushed for inserting and unscrewed for removing. Housing MF12 1000 Nos. 4 Kgs. 3000 Nos. 12.7 Kgs. Housing MF16 1000 Nos. 4.1 Kgs. 3000 Nos. 13 Kgs. Housing MF18 1000 Nos. 4.7 Kgs. 3000 Nos. 14.8 Kgs. 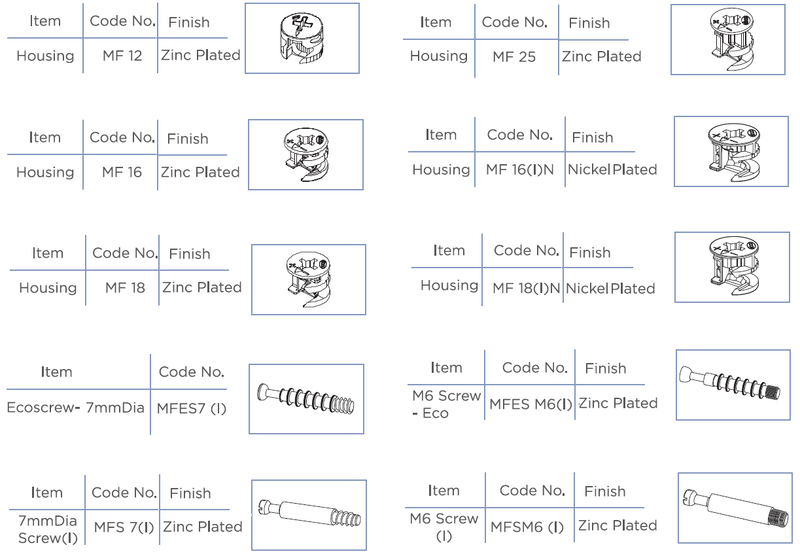 Housing MF 25 1000 Nos. 7 Kgs. 3000 Nos. 21.7 Kgs. 7 mm Dia.ROTOR Screw * MFR7 1000 Nos. 6 Kgs. 3000 Nos. 18.7 Kgs. 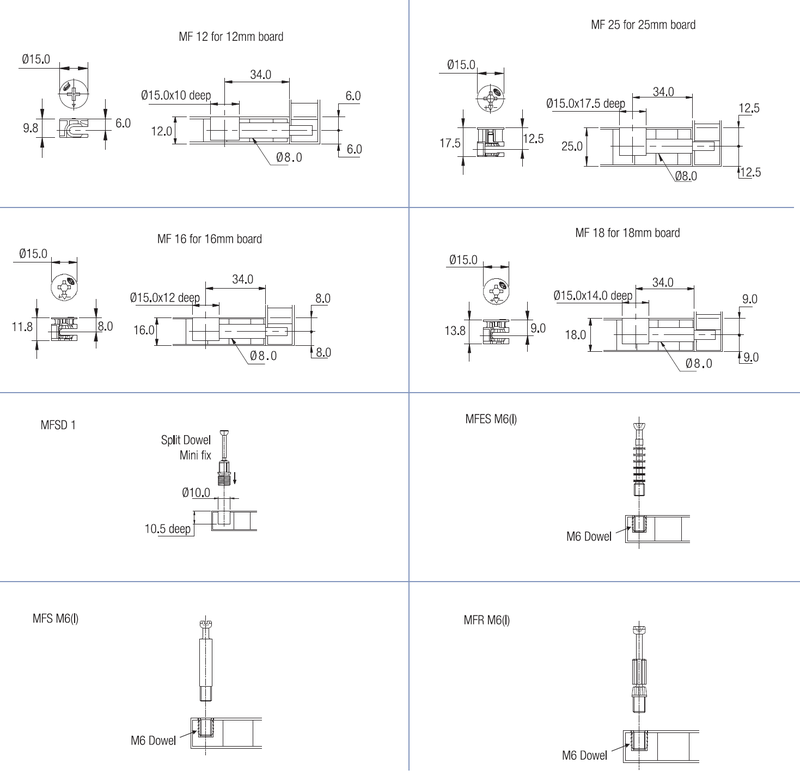 Split Dowel - Minifix MFSD1 1000 Nos. 6 Kgs. 3000 Nos. 18.7 Kgs. 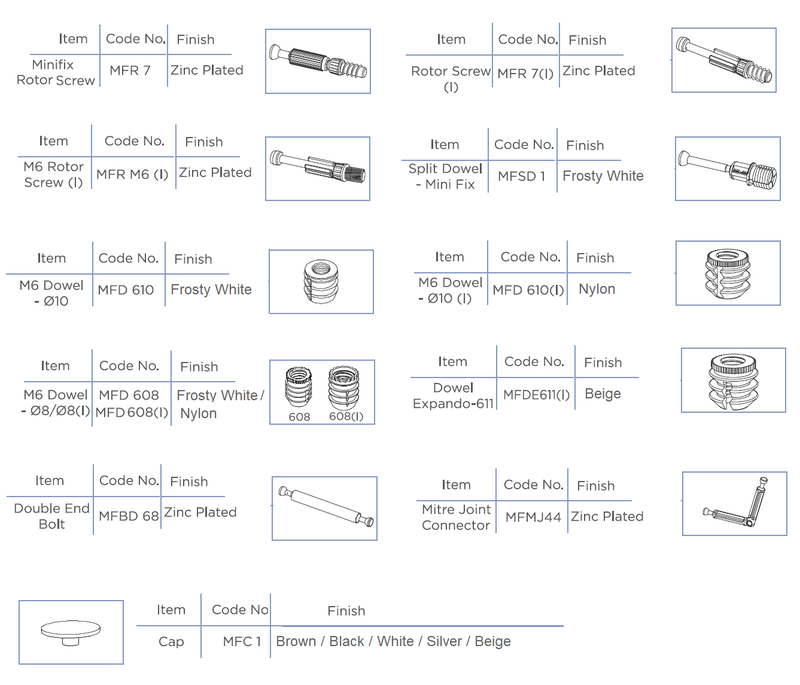 M6 Dowel - ø10 mm MFD610 5000 Nos. 3.5 Kgs. 20000 Nos. 14.7 Kgs. M6 Dowel - ø8 mm MFD608 10000 Nos. 3 Kgs. 40000 Nos. 12.7 Kgs. Cap MFC1 10000 Nos. 1.7 Kgs. 40000 Nos. 7.5 Kgs. 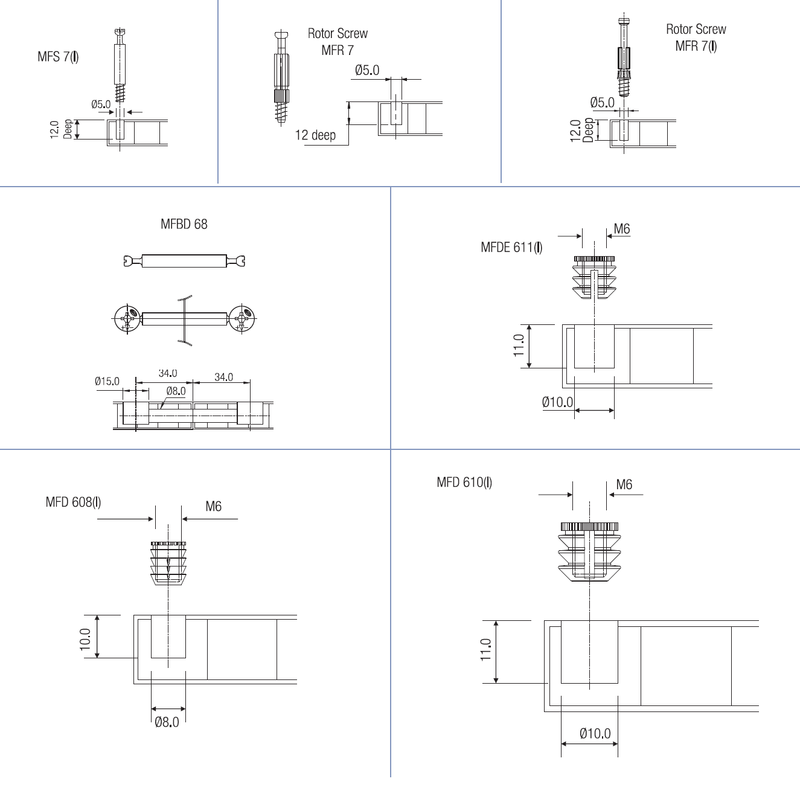 Double End Bolt MFBD68 500 Nos. 8.6 Kgs. 1500 Nos. 26.5 Kgs. Mitre Joint Connector MFMJ 44 500 Nos. 5.9 Kgs. 1500 Nos. 18.4 Kgs. Push Fix PFS1 1000 Nos. 7 Kgs. 3000 Nos. 21 Kgs.